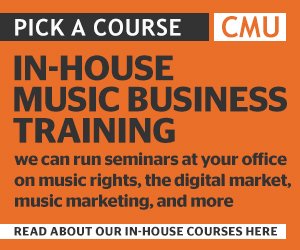 This CMU:DIY Guide is full of advice on how to make money out of music – how to turn what you do as an artist into revenue and a business. But why even bother? Well, if you ultimately want to give up the day job and focus on your music full time, then you are going to need to turn what you do into revenue. At the very least you need to eat and pay the rent. But there are other costs to cover too. You need to start touring – gigging or DJing in new places – because that’s how you build a fanbase. But there’s not much money in gigging until you reach a certain level of venue. So touring will initially cost you money. You need to make, distribute and market your music. Of course it’s a lot cheaper to make and distribute music today than in the past. And social media channels are great free marketing tools. Though the best music is a collaborative effort. Digital distribution still requires a time investment. And everyone has the same social media as you, so you need to do something that makes your social activity stand out. All of that is going to at least cost you time, and possibly some money too. So, you need to start making money from your music. Doing so can be very challenging – and there is an element of being in the right place at the right time to succeed – though it also pays to understand how successful artists make money and the business partners they work with along the way. That’s what this CMU:DIY Guide aims to do. There are three main ways artists make money from their music. They either create and exploit intellectual property. Or they stage and monetise live performances. Or they build a fanbase and monetise the fan relationship. When we talk about IP we are mainly talking about content – ie songs, recordings and videos – but also merchandise. • Songs – ie musical compositions and lyrics. • Film – ie videos. The core ‘music rights’ are the separate copyrights in songs and recordings. Though the music industry also creates lots of video content and lots of artwork and photography. The latter are often given away for free as marketing or packaging, though can also be turned into income by printing the artwork and photography onto merchandise. Copyright law says that if a piece of content is protected by copyright, the copyright owner enjoys certain exclusive ‘controls’ over that piece of content. For example, only the copyright owner can make copies, and distribute or rent out those copies, or adapt the work, or perform it in public, or broadcast it. This is how copyright makes money. If someone else wants to make a copy of your song or recording, or adapt it, or perform it in public, and so on, they have to come to you for permission. And you sell them your permission. Hence money! • In most countries (including the UK) there is no copyright registration – the copyright exists as soon as the creative work is created. There are no forms to fill out or registration fees to pay. • The law tells us who by default owns the copyright. These rules vary from country to country and according to the kind of copyright. In the UK, the songwriter owns the song copyright by default. Whoever organises and pays for a recording to take place owns the recording copyright by default. • Copyrights can be co-owned. If five people co-write a song, they all co-own the resulting copyright. Though it’s for the collaborators to decide how the copyright is shared out (eg is it split five ways or does one person get more, because they did more work or are more famous?) When collaborating on a song you should always have a conversation about how the copyright will be split. • Copyrights don’t last forever, though they last for a long time. So called ‘copyright terms’ vary from country to country and according to the kind of copyright. In the UK, for songs it’s the life of the creator and another 70 years. For recordings it is 70 years after release. 1. The most simple way is ‘direct licensing’. The person who wants to use your song or recording comes to you direct, you negotiate a deal, and assuming you are happy with the price and terms, you reach an agreement. 2. Self-releasing artists often license via a middle-man. For example, rather than every self-releasing artist negotiating a deal with Spotify or Apple Music, companies like Ditto Music and TuneCore negotiate deals, and then artists ‘piggy back’ on those deals. This saves the artist from having to negotiate a bespoke contract, which would be time-consuming and expensive. 3. In certain scenarios the music industry decides to license as one – which basically means everyone uses a middle-man and the same middle-man at that. So, in the UK, all the songwriters and music publishers put all their rights in one pot and tell PRS For Music to do the deal in certain scenarios. And all the recording artists and record companies put all their rights in one pot and tell PPL to do the deal in certain scenarios. This is ‘collective licensing’. PRS and PPL then collect the money and pass it back to their members whenever their songs or recordings are used. These organisations are variously called ‘collecting societies’, ‘performing rights organisations’ (PROs), and ‘collective management organisations’ (CMOs). Collective licensing applies to radio and TV, when recordings of songs are played in clubs, bars, shops and work places, and – on the songs side – with live performance and the recording of cover versions. While we are talking about intellectual property we should note that copyright doesn’t protect names. For that you need another branch of IP called trademarks. Trademarks are a registered right, which means you have to spend a bit of money to get the protection. Therefore it’s not a top priority for new artists. But eventually trademarks could become a part of your business. Big stars make big money by trademarking their names (you can also trademark logos) and then giving other companies permission to create products using their brand, like drinks, gadgets, fashion lines, perfume and so on. And that’s trademark licensing. Live performance is easier to understand. If people are willing to pay money to be in the same room as you while you perform your music, you can make money from live! Though the live music industry doesn’t just make money selling tickets. For starters, there are the booking fees applied to tickets, and some artists and gig promoters also put some of their tickets onto secondary ticketing sites and earn additional mark-ups there. Though some artists think that’s a bad thing to do and the secondary ticketing market in general has become increasingly controversial of late. Once you have the fans in the venue, you can then sell them other stuff. Most important is food and drink, but you can also sell them other services, like parking, cloakroom facilities, queue jump, access to a VIP area and so on. Most established artists make more money from live music than anything else (until they start doing major trademark licensing deals! ), partly because the artist generally gets a bigger cut of live income than record sales income for reasons we’ll explain later. That said, at the outset, artists often lose money gigging. Live becomes lucrative once you start playing middle-sized theatre venues. While you are doing the smaller pub or club circuit, you will likely receive modest fees that may only cover your travel costs. And even if you put on your own show, it is hard making a big profit when you’ve only got 60 people in the room. At the outset live is more about marketing and building a fanbase. This is the newest part of the music business. In order to make money from your content and live performances, obviously you need to build a decent sized fanbase. In the digital age, you can connect with these fans online, via email, social media and other digital channels. And you can connect with core fanbase on a very regular basis, and work out what they like and what they want. Once you’ve worked out what they want, make that thing and sell it them! Traditionally the music industry built a fanbase and then tried to sell them records, tickets and t-shirts. But what if your fans don’t really want to spend money on those things – or not very often? Then find out what they do want and sell them that instead. And with a direct-to-fan store on your own website, doing that is much easier than it used to be. Plus, once an artist has built a decent sized fanbase, brands may start to spend money with the artist to reach that audience. The brand may also want access to tracks, videos or merch (so IP) or tickets (so live), but they may also simply want a relationship with the artist’s online fanbase. The music industry is simply people and companies who help artists turn what they do into money – ie to unlock all the revenue streams we’ve just discussed – so that artists can focus on writing, recording and performing great music. Most music companies specialise in one revenue stream. So you have the live music industry that specialises in putting on gigs and you have the music rights industry that specialises in intellectual property. Though the latter can be split further into the music publishing industry which deals in song copyrights; the record industry that deals in sound recording copyrights; and the merchandise industry that creates products around an artist’s visuals and trademarks. On top of all that, there is a whole new side to the industry emerging that is focused on direct-to-fan. The Record Company (or Record Label) exploits the sound recording rights. They work with the artist to create great tracks and videos, hiring the recording studios, record producers, sound engineers and video directors. They then distribute that content and usually lead on artist marketing, promoting the artist via their key album releases. The Music Publisher exploits the song rights. They handle the licensing of songs – either directly or via the collecting societies – and make sure all the royalties due are flowing in. They may also seek ‘sync deals’ and original song commissions on behalf of the writer. Traditionally the publisher published sheet music (hence why we call them ‘publishers’) and some still do. The Merchandiser handles the production of merchandise, obviously. They might have their own sales platform online and/or might distribute merch to other sellers. They may also license the artist’s artwork or trademarks to third parties who want to create products using the act’s visuals or brand. The Promoter stages gigs, tours and festivals. They take the financial risk on the show, hire the venue and all the production staff, and put the tickets on sale. They market the show and may seek sponsors. The Booking Agent sits between the artist and the promoter. They are constantly looking for opportunities for the artist to play live – whether their own shows, club or festival slots, tour support slots, corporate gigs etc – and also negotiate the deals. The agent may also get involved in seeking sponsors for live activity. The Ticket Agent sells the tickets, obviously. They will provide an online platform via which to sell the tickets as well as customer support. They will also likely have a mailing list and may get involved in marketing the show. And they may be able to provide the promoter with cash flow to help get the show off the ground. 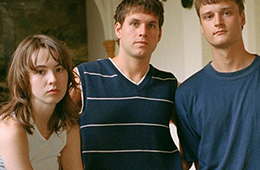 Direct-To-Fan Companies are the newest part of the music industry. Most D2F companies currently are technology-based – ie they provide the platform for building and selling to an online fanbase. Though you are starting to see people specialising in running direct-to-fan stores. Labels and promoters are also getting involved in this. Brand Partnership Companies negotiate deals between artists and brands. Because brands often want content, merch, tickets and access to fanbase – but don’t want to have to deal with a label, publisher, merchandiser, agent, promoter and D2F company – they often look for a third party agency to do all the leg work. Many labels, promoters and agents also now have brand partnership teams. Obviously at the outset a new artist has no business partners. You have to do it DIY – more on which in Part Two. The first business partner you probably need is management – this is the one person involved in every aspect of your career. At the outset the manager has to do a lot of work – because they basically perform the tasks of all the business partners: getting content made and out there; logging songs with PRS; setting up merch; looking for gigs; possibly putting on gigs; doing all the marketing, social and D2F; and maybe looking for brand partnership opportunities too. But the manager is also looking for business partners. The right label, publisher, merchandiser, promoter, booking agent, ticket agent, D2F platform and brand partnerships team. They will slowly do deals with those business partners, handing over some of the work (and some of the control) as each deal is done. Once every deal is in place, the manager’s job is to ensure both artist and business partner deliver on all their obligations, while also seeking new opportunities and thinking long-term – where will the artist’s career go next?